Carrier’s reputation was founded on our ability and commitment to solve the unique processing application problems of our clients. We have conducted hundreds of tests throughout our 60 years and welcome the opportunity to help solve any process challenges you may have. Carrier’s 20,000 sq. ft. R&D lab offers an extensive line of equipment to test a combination of processes such as convey, cool, dry, dry/cool, elevate, feed, flatten, pelletize, screen, shake, sort, and withdraw. Depending on the complexity of the tests, work can usually be completed in one or two days. Research new equipment designs, processes, and methods in confidence. 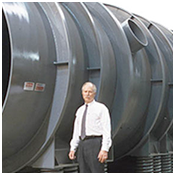 Improve efficiencies of existing process lines. Chart material characteristics and behavior in a specific process situation. Ensure equipment meets specs and qualifies for performance warranty. Analyze test data to assist in equipment selection. The purpose of our testing program is to verify process design requirements to provide optimum sizing of all equipment to satisfy your operation requirements. 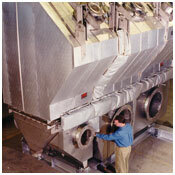 It also allows us to offer a process warranty for your specific application. Carrier understands the confidentiality of testing new products. We recognize the importance of respecting your privacy and support mutual Confidentiality Agreements. Our facility is as flexible as your schedule and we strive to work within your time constraints. We welcome you to visit our facility and witness the lab tests. Resources are available to video the test if you are unable to join us. Please contact us for a further explanation of our laboratory services and fees. 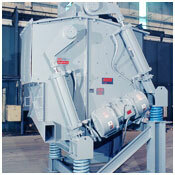 Process test fees are refundable against production equipment purchase. Carrier’s laboratory is equipped with the latest design processing equipment. Testing and demonstrations can be conducted on small in-house lab scale units or field rental units. Laboratory capabilities include simulated testing on batch and continuous fluid beds, conventional and vibrating fluid beds, media slurry dryers, Tornesh dryers, flash dryers, spirals, and indirect dryers/coolers. Note: A Material Safety Data Sheet (MSDS) must be affixed to the outside of the shipping container. No test material can be opened or handled without proper documentation of material composition and the associated safety precautions to be taken by our staff. If you do not have a formal MSDS, a blank form can be faxed to you for completion. Test material will be returned to you upon completion of tests.